Nestled in the Sierra Nevada mountains of California, Yosemite National Park is best known for its giant sequoia trees, towering granite cliffs, and excellent hiking. Some accommodation options are located right inside the park, but there are also plenty of hotels around the park borders for guests who prefer to be closer to restaurants, shops, and other amenities. Found right next to the Sierra National Forest, the Tenaya Lodge at Yosemite is a luxurious resort set on a beautiful 75-acre property. The rooms and suites in the main lodge offer flat screen TVs, mini fridges, and coffee makers, and some also have whirlpool tubs. Guests looking for a little more privacy can choose to stay in one of the resort's cottages, which feature cozy fireplaces and private patios. The resort's world-class spa is the perfect place to relax and unwind, and guests are also welcome to enjoy the fitness center, game room, three pools, and multiple restaurants. Located right next to the border of the park, the Evergreen Lodge at Yosemite consists of 88 cabins scattered across a gorgeous 20-acre property. 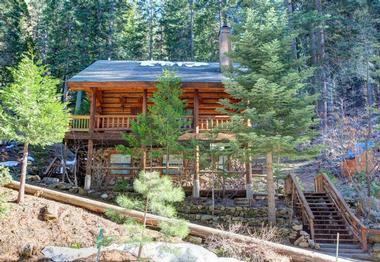 Several different types of cabins are available, including cozy vintage cabins and deluxe cabins with gas fireplaces. Regardless of type, all contain Alexa Devices, gourmet coffee makers, and beautiful pieces of historic artwork. Furnished tents are also available for visitors who want to spend as much time in nature as possible. There are also plenty of on-site amenities, including a seasonal pool with a bar, a children's play area, a theater, and a tavern-style restaurant. Tucked between Gull Lake and June Lake, Gull Lake Lodge is a family-operated property with affordable but comfortable accommodation. You can access the one-bedroom suites via exterior corridors, and they come with free Wi-Fi, full kitchens, cable TV, and separate living areas. 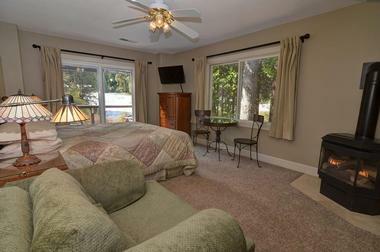 There is also a two-bedroom cabin available for rent, which offers a wood-burning fireplace and a private patio. All guests are welcome to make use of the shared patio, which offers barbecue grills and wonderful views of the surrounding mountains. Complimentary on-site parking is available, and pets are welcome in some rooms for an additional fee. 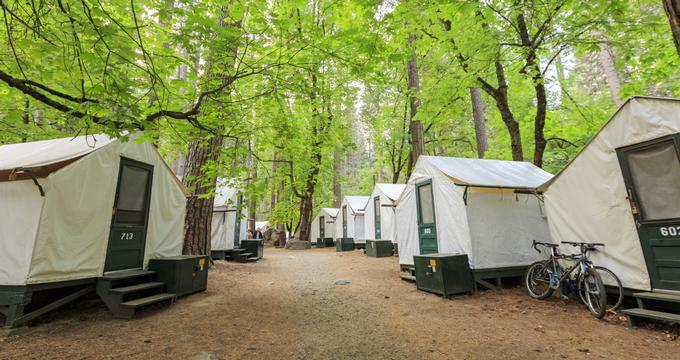 Founded in 1899, Half Dome Village offers multiple accommodation options, including rustic wood cabins, furnished canvas tents, and standard hotel rooms. Amenities vary greatly between the different types of accommodation; the tents are unheated but have electric lighting, while the cabins come with electrical outlets and heaters. Showers and toilets can be found in the shared bathhouses. None of the rooms have TVs or phones, but guests are welcome to enjoy the property's seasonal pool. Cooking is not permitted anywhere in the village, but guests can prepare their food on grills in the designated areas in Yosemite Valley. You can only access the High Sierra Camps by foot or by horseback, but the sites are fully equipped so that visitors only need to carry a day pack when hiking in. There are five different camps spaced out along a loop trail. The loop is 49 miles in length, and the camps are all between 6 and 10 miles apart. A packing service is available for guests who don't want to carry in their own supplies, and dinner is available at the camps if requested in advance. Because of the camp's popularity, there is a lottery system for reservations, with applications being accepted every October. With thirteen quaint rooms to choose from, Hotel Charlotte is a Victorian-style boutique hotel that has been in operation since the early 1920s. The rustic rooms feature clawfoot tubs and plenty of traditional charm, but they also offer modern amenities like satellite TV and complimentary Wi-Fi. Some rooms are pet-friendly. Breakfast is included in the room rate, and the on-site restaurant and bar specializes in tapas and specialty cocktails. 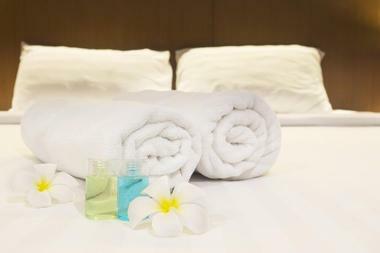 In-room massage treatments are available if booked in advance, and special discounts are available for long-term stays. Guests are welcome to park on the property free of charge. Sitting right next to the Merced River, the Housekeeping Camp is one of the most affordable lodging options in the park. The camp was originally created to allow visitors to enjoy the experience of camping without the hassle of bringing all their own equipment, and it offers unique three-walled units with canvas roofs and a curtain along the fourth wall. Communal facilities include a showerhouse, restrooms, a general store, a fire pit, and a laundry room with coin-operated machines. The camp only operates between April and October, and bedding is available for rent on-site. The camp is accessible by car, and parking is available. Conveniently located in the heart of Mariposa, the Miners Inn offers easy access to plenty of shops, restaurants, and cafes. It also has an on-site restaurant and lounge that hosts live music on the weekends. The rooms all offer basic amenities like televisions and coffee makers, and some feature luxurious extras like fireplaces, private balconies, and hot tubs. If you don't choose a room with a hot tub, you can still visit an outdoor pool and hot tub available for guest use. A complimentary shuttle service is offered to and from the airport, and free on-site parking is available for vehicles of almost every size. Named after its proximity to the Yosemite Mountain Sugar Pine Railroad, the Narrow Gauge Inn is conveniently situated only four miles away from the park's south gate. The cozy rooms feature views of either the mountains or the surrounding forest, and they offer amenities like coffee machines, free Wi-Fi, TVs, and shared or private balconies. 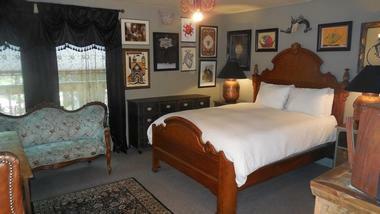 Some also have special touches like clawfoot tubs, vaulted ceilings, or four-poster beds. A complimentary hot breakfast is served in the restaurant every morning. The restaurant is also open for dinner on select evenings, but advance reservations are highly recommended. 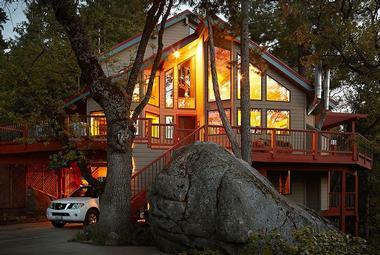 Opened in 2016, Rush Creek Lodge at Yosemite is one of the newest lodges in the area. The rooms and suites are clean, comfortable, and modern, and they're equipped with amenities like Keurig coffee makers, complimentary Wi-Fi, and mini fridges. The suites also have cozy living areas with fireplaces, and villas with extra bedrooms are available for groups of up to six people. Other amenities include a seasonal pool with a full-service bar, an on-site convenience store, and a children's playground. The on-site restaurant is open for breakfast, lunch, and dinner, and a special barbecue menu is available during the summer. Housed inside a beautiful historic building that dates back to 1927, the Majestic Yosemite Hotel is a four-diamond hotel conveniently located only a mile and a half away from Yosemite Village. The rooms are furnished with comfortable pillowtop mattresses, flat screen TVs, and refrigerators; some also offer balconies with stunning views of the cliffs or the waterfall outside the hotel. When you’re not in your rooms, you are welcome to make use of the hotel's elegant shared spaces, which include a sitting room with a fireplace and stained-glass windows and a dining room that is open for breakfast, lunch, and dinner. Nestled in the mountains more than 8,700 feet above sea level, Tuolumne Meadows Lodge is one of the only accommodation options in the Sierra Nevada high country. There are 69 basic canvas cabins for guests to stay in. Each one can accommodate four people, and although there is no electricity, they stay warm thanks to cozy wood-burning stoves. 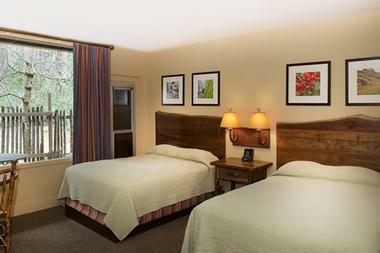 Bedding is provided, and shared restrooms with showers can be found on-site. The lodge is open between the middle of June and the middle of September, and a shuttle service is available to transport guests between Tuolumne Meadows Lodge and Tenaya Lake. Set in a beautiful meadow ringed by pine trees, the White Wolf Lodge is a peaceful wilderness getaway with a selection of cozy cabins. Four of the cabins are made from wood, and they offer private bathrooms, electricity, and a daily housekeeping service. The rest of the cabins are made of canvas, and although they do not have electricity, they do have beds and wood-burning stoves. Guests staying in these cabins have access to a shared bathhouse with showers and toilets. Cooking is not permitted in any of the cabins, but the there is a central dining room with a large porch. The Yosemite Bug Rustic Mountain Resort was first opened in the 1930s, and it boasts a beautiful hillside location less than 30 miles away from the Yosemite Valley. There are multiple different types of accommodation to choose from, including hotel rooms, hostel dorm rooms, and glamping tents furnished with rustic wooden furniture. A big draw of this resort is its excellent amenities; in addition to a restaurant that specializes in preparing dishes with locally-sourced ingredients, the resort offers a unique health spa with a cedar sauna, a large stainless steel hot tub, and several herbal therapy rooms. Only eight miles away from the park, the Yosemite Cedar Lodge is a cozy budget hotel with more than 200 family-friendly rooms and suites. 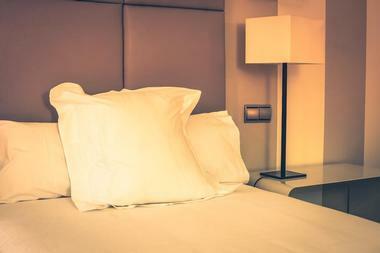 All rooms are equipped with cable TV, and some offer coffee makers and mini fridges. Guests in need of more space can also book the three-bedroom suite, which features a full kitchen, two fireplaces, and in-room laundry machines. When not in their rooms, guests can enjoy the property's many amenities, including pools, hot tubs, a sports bar, a private beach on the river, and a restaurant that serves up American-style comfort food. 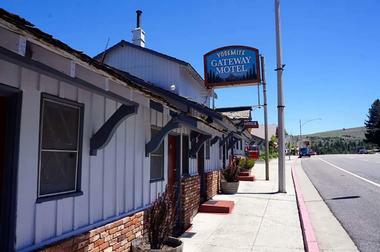 Right across from the stunning Mono Lake, the Yosemite Gateway Motel offers simple rooms with beautiful lake views. The rooms are spread across three different buildings, but all offer the same amenities: flat screen TVs with satellite, complimentary Wi-Fi, coffee machines, and private bathrooms with either tubs or showers. Some rooms also feature private balconies or French doors, but all guests are welcome to enjoy the property's shared sundecks offering comfortable seating and lovely views of the water. Complimentary parking is available on-site, and hot beverages are available in the lobby all day long. 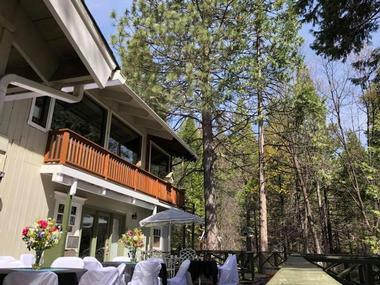 Set on the banks of a peaceful creek, Yosemite Lodging at Big Creek Inn B&B is a traditional bed and breakfast with three charming guest rooms that can accommodate two people each. 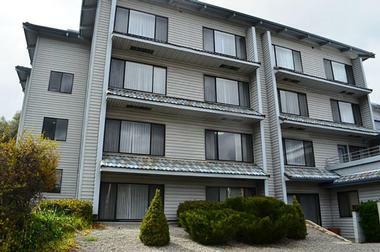 All rooms come with private bathrooms and balconies, and they offer amenities like flat screen TVs and soaker tubs. 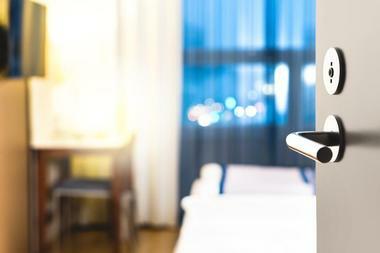 Complimentary Wi-Fi is available throughout the property. A breakfast buffet is included in the room rate and is served in the dining room every morning. Other amenities include a game room, a deck with a ping pong table, and a common area with a small kitchenette. 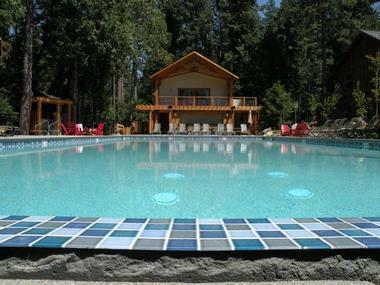 Situated right inside the park gate, the Yosemite Peregrine Lodge is an upscale vacation rental home with three bedrooms and three bathrooms. Beautiful floor-to-ceiling fireplaces can be found in each of the bedrooms and in the living room. Heated tile floors ensure that the home is always warm during the winter. The home also offers a well-equipped kitchen with granite countertops, a dining area, and a spacious deck with a barbecue grill. Unlike many of the other homes in the area, this one boasts an accessible level entry, but guests able to climb stairs will find a cozy loft on the second floor. 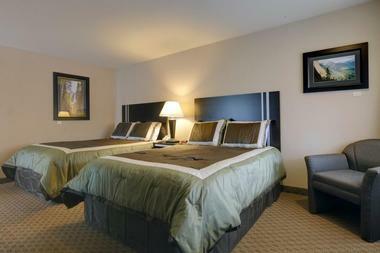 As the name suggests, the Yosemite Southgate Hotel and Suites is just a few minutes away from the park's south gate. The suite-style rooms are approximately 500 square feet in size, and they're equipped with amenities like large flat screen TVs, complimentary Wi-Fi, coffee makers, and mini fridges. A continental breakfast is included in the room rate, and the on-site coffee bar is conveniently open 24 hours a day. Other highlights include a seasonal outdoor pool and hot tub, a gift shop, a small business center with a printer, and a cozy lobby with a fireplace. Featuring breathtaking views of Yosemite Falls, the Yosemite Valley Lodge is a cozy lodge with a beautiful glass and wood exterior. There are 245 rooms to choose from, all of which offer private bathrooms, coffee makers, and televisions. Some also have a balcony or patio. Wi-Fi is available in all rooms free of charge, but the connection is quite slow and guests are typically not able to stream video. The park shuttle stops right at the lodge, and complimentary on-site parking is available. Other amenities include an outdoor pool, a comfortable lounge, and a restaurant that specializes in steak and seafood. Designed to serve as a home away from home for visitors to the park, the Yosemite West Cottages come with full kitchens, private decks, and separate sitting areas with satellite TV. Some also offer extra perks like fireplaces or sofa beds. The units range in size from studio-style rooms to spacious three-bedroom cabins. The largest unit can accommodate up to ten people, but there are plenty of options for smaller groups as well. No Wi-Fi is available on the property, but all rooms are equipped with landlines so that guests can make phone calls as needed. Conveniently located just off State Highway 120, Yosemite Westgate Lodge offers spacious, rustic rooms and plenty of amenities. 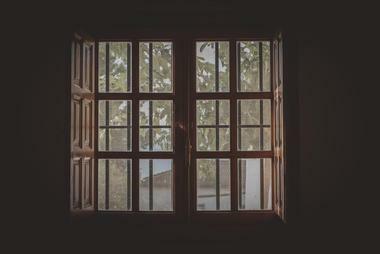 The rooms are decorated with beautiful photographs taken by a local artist, and they offer flat screen TVs, air conditioning, and simple kitchenettes equipped with microwaves, mini fridges, and coffee makers. Wi-Fi is available throughout the property, but it is not always reliable because of the lodge's remote location. Other amenities include a heated outdoor pool, a hot tub, a children's playground, a laundry room with coin-operated machines, and a restaurant that often hosts live entertainment. On-site parking is available free of charge. 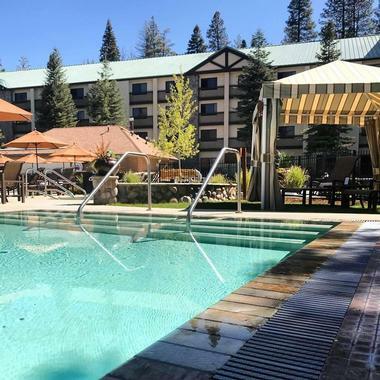 Set on a forested seven-acre property fifteen miles away from the park's south entrance, the BEST WESTERN PLUS Yosemite Gateway Inn is a comfortable lodge-style hotel perfect for almost every kind of traveler. The peaceful nature-themed rooms have flat screen TVs, free Wi-Fi, and small kitchenettes equipped with microwaves, mini fridges, and coffee makers. Some also offer balconies or patios and separate living rooms with pull-out sofa beds. The on-site restaurant is open for breakfast, lunch, and dinner, and other hotel amenities include two pools, a fitness center, two outdoor barbecue areas, and a lobby with a stone fireplace and large windows. 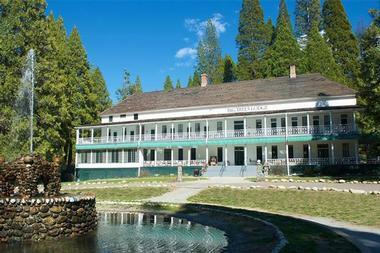 Dating back to 1856, Big Trees Lodge was one of the first resort hotels in the area. The lodge is located inside the park, making it a perfect choice for visitors who want to truly immerse themselves in nature. There are over 100 rooms to choose from, approximately half of which have private bathrooms. Guests are also welcome to enjoy the many amenities on the property, including a 9-hole golf course, a pool, a dining room, and a sunroom that boasts incredible views. The lodge is open from the end of March to the end of November. Offering elegant rooms and a welcoming atmosphere, the Blackberry Inn Bed and Breakfast is nestled in the forest near the park's north entrance. There are two types of accommodation to choose from: the rooms in the main building have cozy electric fireplaces, while a separate building houses beautiful suites with private patios, soaker tubs, and vaulted ceilings. Breakfast is included in the room rate, and it's served either in the dining room or on your private patio depending on which type of room you're staying in. Complimentary homemade cookies are offered every day, and free Wi-Fi is available throughout the property.